What is the E-Scan Exam? ​​MyoVision utilizes technology similar to the EKG. Instead of measuring heart muscle patters, we measure the muscular compensation about the spine. The MyoVision exam is an electronic form of palpation, providing an objective means of quantifying an important measure of spinal health. The exam takes only a couple of minutes. ​Not at all. It is non-invasive and does not cause pain or irritation. This makes it safe for children, pregnant women and seniors. It simply requires the placement of small electrodes against the skin. Muscles compensate for pain and/or spinal subluxation by tensing up to brace and guard. The MyoVision objectively documents this pattern of muscular guarding, establishing need for care and tracking progress over time. Colors indicate level of tension, with green, pink, red and yellow corresponding with average, moderately high, high and very low readings respectively. Percent difference displayed is the difference between left and right sides at the level measured, with arrows pointing the direction of imbalance. Both very high (red) and very low (yellow) readings are significant. High readings (red) are typically seen in the acute phase of spinal subluxation or injury, while very low readings (yellow) are commonly seen when muscles are in a chronic state of fatigue. ​Just as blood pressure cuff is used to track your cardiovascular health, the MyoVision is used to track your spinal health. The data helps determine the proper course of care and track your progress over time. 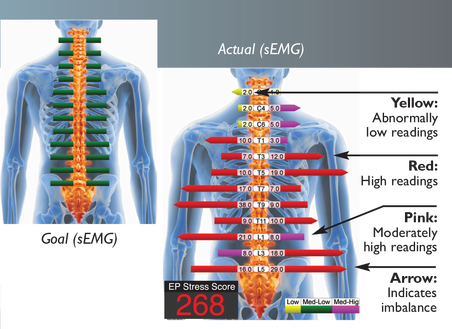 The Electrophysiological (EP) Stress Score is calculated by adding up all muscle activity readings for both left and right sides at all levels of the spine. This sum of all muscle activity about the spine provides a baseline measurement for which all subsequent readings are compared. This allows us to track your progress over time with a simple single number. This number means very little on its own. The first reading is used to create a baseline. All subsequent readings are compared with the baseline for the purpose of tracking progress. ​Elevated EP Stress Score readings on a first exam are associated with the acute state of subluxation and/or spinal health. Readings typically will drop after 4-6 weeks of care. Low EP Stress Score readings on a first exam are associated with a chronic problem, with muscles in a state of fatigue. 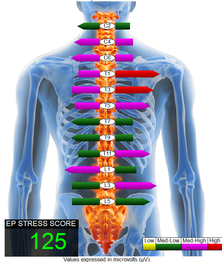 Expect your EP Stress Score to increase, as muscles begin to fire more normally. 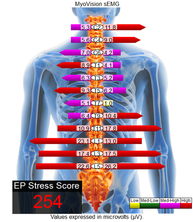 Since no one lives static lives, expect your EP Stress Score to reflect your activities of daily living. Everything from sitting at the computer too long to playing sports will impact your score. Find a MyoVision Powered Chiropractor Near You!